NEW PRICE--SELLER SAYS BRING US AN OFFER! 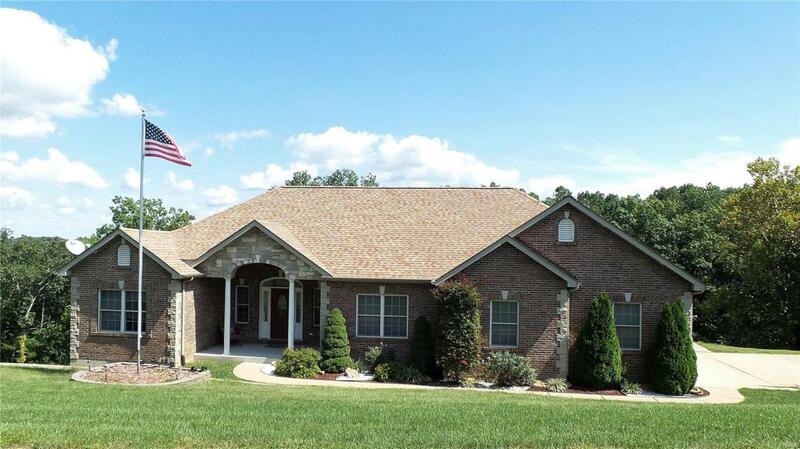 !Custom Atrium Ranch 3,000 sqft total living space nestled on 4 acres, 4 beds, and 3.5 baths. Great room has vaulted ceiling, ceramic tile, floor to ceiling windows & gas fireplace. Dining room boasts hardwood floors and tray ceiling. Kitchen has upgraded maple cabinets, Corian counter tops, recessed lighting, stainless steel appliances, tile flooring, pantry, breakfast bar, lots of room for the chef at work. Breakfast room walks out to composite deck that overlooks backyard. Master suite with coffered ceiling, crown molding and walk in closet. Master Bath has dual sinks, jetted corner tub, water closet and separate shower. Walk out basement perfect for entertaining guests with recreational area, full bath, bedroom with walk in closest, 2 bonus rooms, storage room. Other amenities include arch doorways with rounded corners, side entry Over-Sized 3 car garage, main floor laundry, shed, newer roof, and freshly painted.